Amazing and away from tourist traps. Excellence room and service. Nice hotel, and the staff are very friendly. Considering the constant traffic jams in L.A. the hotel is around 30-35 minutes to the Hollywood area. This hotel is also located were most Hispanic people are living so you can find that the people in this area are fully bilingual. Everything was amazing! Best people as well as hotel we ever stayed in LA!!! !keep up the great job! Nice hotel wish they had a Jacuzzi with the pool, it would help a lot! Also, the spa needs to be open 7 days a week. Good place to stay, nice people, confortable and peaceful. The staff was nice and helpful; the Starbucks is open 24 hours; the room was clean; although the furniture wasn't comfortable and the bathroom has very poor lighting. Sadly, the room was terribly over priced and the gambling was not at all what I expected. I won't be staying here again and I won't recommend to friends. The hotel is located to many restaurants and shops in walking distance. The customer service is awesome. The spa was affordable and I had the best time in my soaking tub! Valet is quick will def be back. Only stayed 1 day. Hotel was very nice..brand new. We ordered room service it was really good. When we arrived A/C was turned off was a little warm for a little while but did cool down. It's a nice new hotel. The air system in the room took some time to understand. Also, it would be nice to have a Jacuzzi on premise. Otherwise, nice! The hotel was recently added to the casino. The hotel was great but the businesses attached to the hotel we not. The restaurant? We waited 20 minutes to get a waiter while the tables around us were served multiple times and when they finally brought my lemonade the glass was filthy, dirt particles all in it, They replaced my drink "free of charge" ($2). We ordered "pan seared pork dumplings" which looked like what you get from Costco and they were obviously nuked - not pan seared. I ordered a BLT .... stale bread, bits and pieces of bacon, with limp noodle-ish fries that included a large piece calamari tendons in the mix - really? So they just fried my potatoes in the same basket as the calamari without cleaning the basket? About 1 hour later I found what seemed to be particles of a hairnet in my teeth. This place should be bought out by someone who cares. This was a nice clean hotel that was a good value. The entire experience at this Hotel exceeded my all expectations. Highly recommend the suites, very nice & very spacious. The Bicycle Hotel & Casino places you next to The Bicycle Casino and within a 15-minute drive of Citadel Outlets. This 99-room, 4.5-star hotel has a full-service spa, a casino, and 2 restaurants. This hotel is home to 2 onsite restaurants, perfect for a quick bite to eat. Savor a meal from the comfort of your room with room service, or get a quick energy boost at the coffee shop/café. For your convenience, a buffet breakfast is served for a fee each morning from 7 AM to 11 AM. 42-inch a flat-screen TV are available for entertainment, and guests can stay connected with free WiFi. 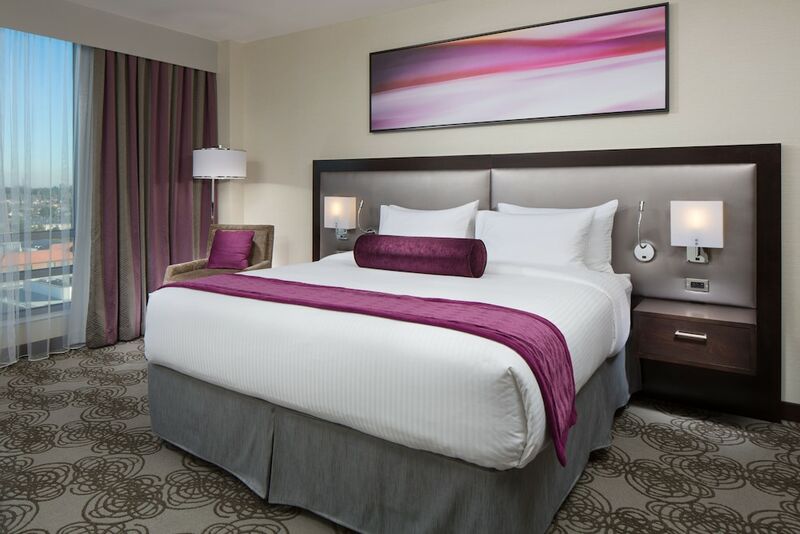 Pillowtop beds sport premium bedding and the bathroom offers a hair dryer and designer toiletries. Other standard amenities include a refrigerator, a coffee maker, and a laptop-compatible safe. Guests of The Bicycle Hotel & Casino have access to a full-service spa, a casino, and an outdoor pool. The 24-hour front desk has staff standing by to help with luggage storage, securing valuables, and dry cleaning/laundry. Other amenities at this luxury hotel include a fitness center, free WiFi in public areas, and conference space. Thank you for staying at The Bicycle Hotel & Casino. We are thrilled to hear you enjoyed your stay with us. We hope to see you in the near future. Thank you for staying at The Bicycle Hotel & Casino. We happy to hear you enjoyed your time with us and hope to see you in the near future. Dear Guest, Thank you so much for taking the time to rate our hotel. We are extremely proud of the service our staff delivers to our guests and we are happy to hear we met your expectations. Thank you for choosing to stay at The Bicycle Hotel and Casino and we look forward to your next visit! Hello Miguel, Thank you for staying at The Bicycle Hotel & Casino. We are happy to hear you enjoyed your time with us and we hope to see you in the near future. Hello Michele, Thank you for staying at The Bicycle Hotel & Casino. We are thrilled to hear you had a fantastic time with us & hope to see you in the near future. Dear Valued Guest, Thank you for taking the time to leave us with your review. We greatly appreciate it! Your comments will be shared with the proper departments. Thank you for choosing the Bicycle Hotel and we look forward to your next stay! Hi Jerry! Thank you for staying at The Bicycle Hotel & Casino. We are thrilled to hear you enjoyed your stay with us. We hope to see you in the near future. Dear Jose, Thank you for taking the time to leave a review and rate our hotel. We are extremely happy to hear we exceeded your expectations. Thank you for choosing to stay at The Bicycle Hotel and Casino and we look forward to your next visit! Thank you for staying at The Bicycle Hotel & Casino. We appreciate all feedback and hope to see you in the near future. Dear David, Thank you for taking the time to leave us with your feedback. Great idea and I will be more than happy to past that suggestion to the proper department for consideration. Thank you for choosing the Bicycle hotel and we are glad you enjoyed your stay. We look forward to your next visit! Phoenix Cafe - Cafe specializing in Asian cuisine. Recreation features at The Bicycle Hotel & Casino include an outdoor pool and a fitness center.